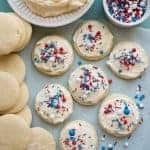 The Best 4th of July Cookies on the Block are super puffy and soft sugar cookies with the cutest sprinkles ever – and they travel well too! Can you believe that the Fourth of July is just around the corner? I love this holiday for so many reasons! Our amazing country and our independence are pretty great things to celebrate, plus I love all the food, parades, games, and fun that’s to be had on such a holiday. Our town maybe be little, but it sure does the 4th of July well. 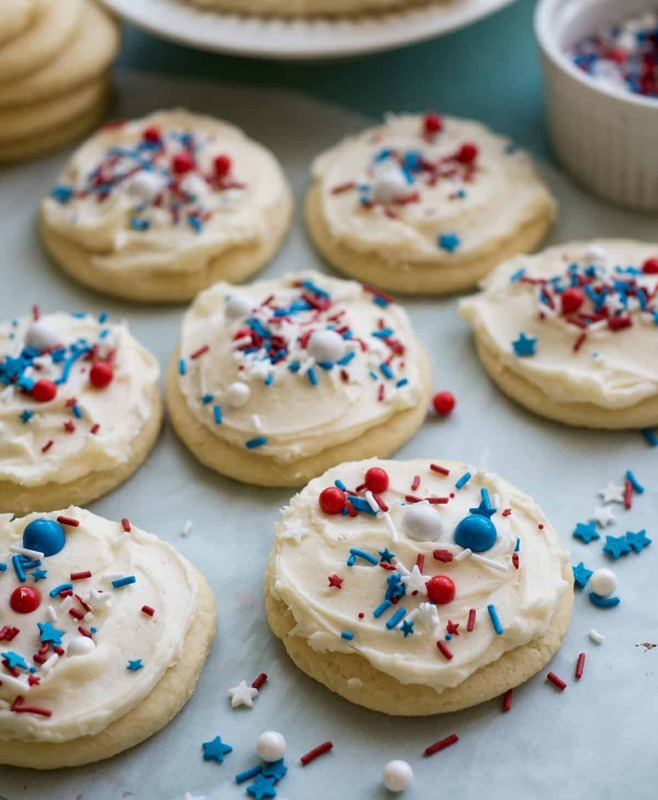 I wanted to share a recipe for super simple 4th of July Cookies with you today. If you aren’t in charge of dinner but are a guest headed to a party, these are the perfect things to bring along! You can make the dough ahead of time, they are so cute, and everyone loves a soft sugar cookie with sprinkles! 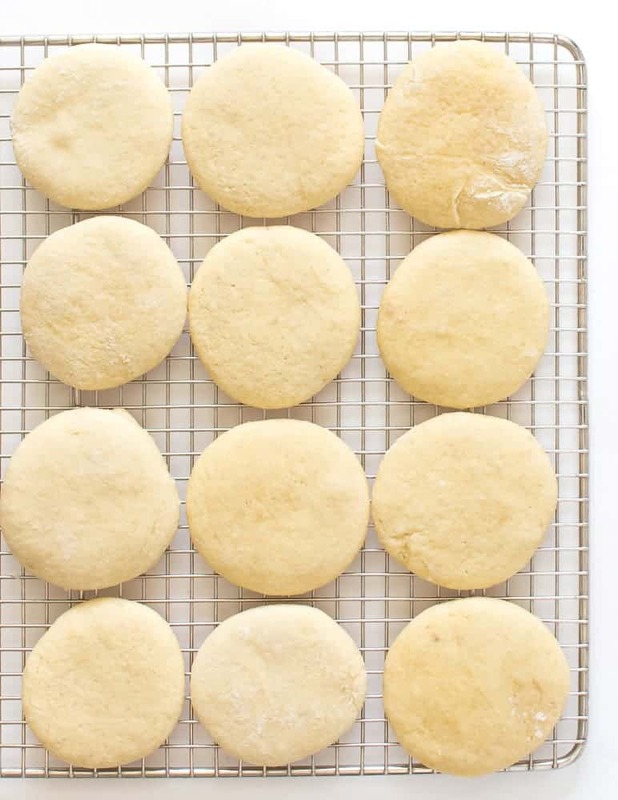 These cookies hold their shape super well, are extra soft and puffy, and taste just like a Lofthouse sugar cookie. The secret to their super soft texture is Greek yogurt, which can also be subbed out for sour cream. Don’t use reduced fat or fat free products here though, full fat is best. I love this set of stainless steel biscuit/cookie cutters and used them for this recipe. The dough needs to be chilled for at least 4 hours before using, but it can stay in the fridge for up to 36 hours. Great if you need to plan ahead a bit! I’m obsessed with these patriotic sprinkles! I got them online here. If you are traveling with these cookies a short distance, just carry them in a single layer. If you are going a longer way, you might want to take the cookies and frosting separately and assemble before serving. In a large bowl cream the butter and sugar together until light and fluffy, about 3 minutes. You can use a stand mixer, an electric hand mixer, or a fork and some elbow grease to do this. It’s up to you. Add the egg and vanilla and stir until very smooth. Add the Greek yogurt and stir until combined. Add the baking powder, baking soda, salt, and all-purpose flour and stir until well combined. The dough will be sticky. Place the dough on a piece of plastic wrap, shape into a disk, wrap well, and refrigerate for at least 4 hours and up to 36 hours. When you are ready to bake the dough, remove it from the fridge, unwrap, and divide it into 2 pieces. Roll the dough out to 1/2 inch thick on a well-floured surface and cut into shapes (I used a 3-inch circle cookie cutter). Place the cut out cookies on a parchment- or baking-mat-lined cookie sheet and bake at 350 degrees for 10-11 minutes. The tops of the cookies will be light but the bottom should be lightly brown. To make the frosting add the butter, vanilla, and 1 tablespoon of cream or milk, and the dash of salt to a large bowl and beat until fluffy, about a minute (a stand or hand mixer work well for this). Add the powdered sugar and beat until smooth and fluffy. If the frosting is too thick, add the additional tablespoon of cream or milk and beat again. 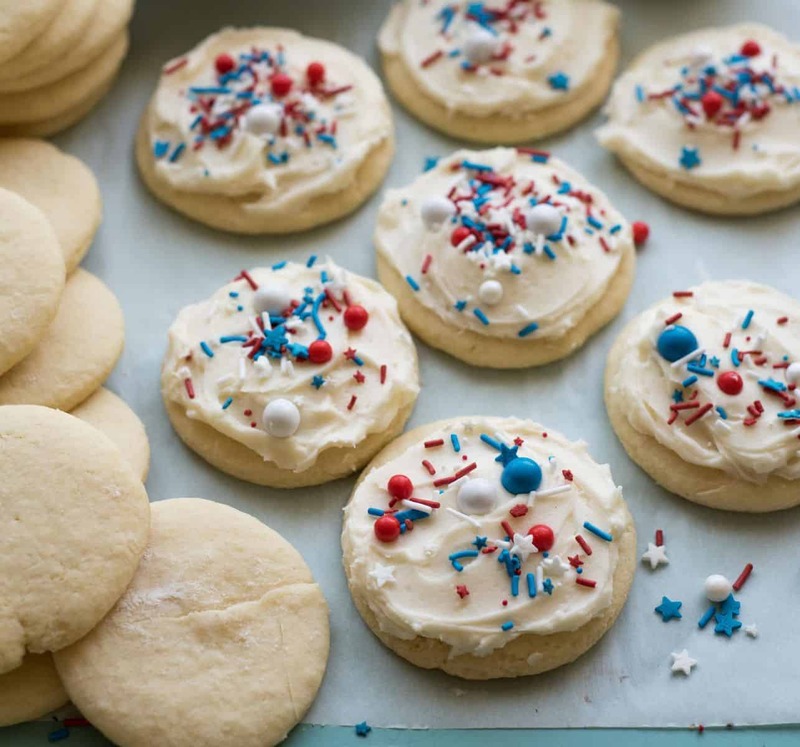 When the cookies are completely cooled, add a generous helping of frosting and 4th of July sprinkles. You can make the dough up to a day ahead of time and keep it in the fridge until you are ready to bake. The cookies can also be made a day ahead of time and stored (unfrosted) in an airtight container. These travel best in a single layer. They really are the cutest 4th of July cookies around, aren’t they? 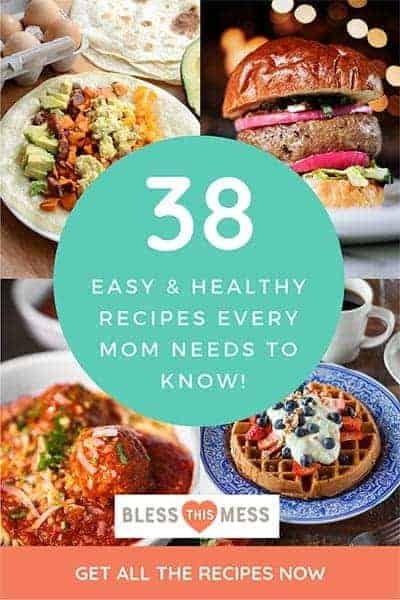 I love a good party, so I also wanted to include a list of my favorites foods to take/eat/make for a picnic, party, or cookout. 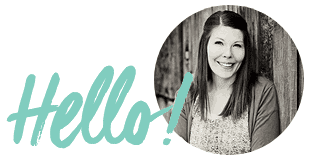 Let me know if you make one – few things make me happier than seeing my recipes in your kitchen! And do tell, what are you excited to eat over the weekend?! These cookies look wonderful! The sprinkles are super cute, and I bet they taste amazing. I want one! !